Originally appeared on the Red Cross Northern California Coastal Region blog. Two little girls — Tamara Haltsonen, who was then 6 years old, and her older sister, Lidia, who was 10 — illustrate the unfathomable human toll of the infamous siege: The girls suffered through the death of their mother, Tatiana, to starvation and/or illness, and the loss of their father, Alexsander, to the “German Labor Camps.” Devastated and suddenly with no one to care for them, the two were placed in separate sections of a local orphanage, before being moved with other evacuees to a monastery in Vilnius, Lithuania. Both girls were eventually adopted by different families. Miraculously, Alexsander survived and eventually found his two daughters. However, by then Tamara was in failing health, so he was counseled to leave his daughter with her new family. 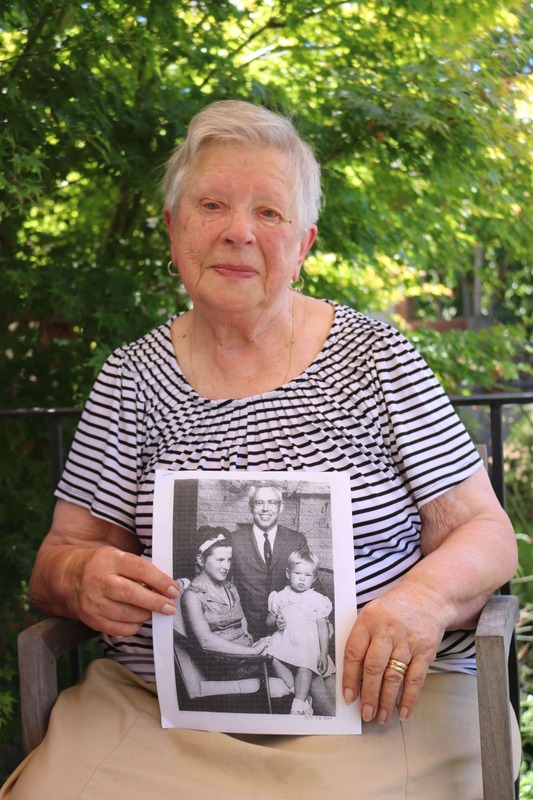 Tamara’s health would slowly improve, but she would never see her father again, as he and Lidia began a torturous decades-long odyssey that included difficult years in German-occupied Finland and even more hardships behind the Iron Curtain in war-torn Russia. Young Tamara and her new family, meanwhile, moved to Germany, then to Chicago in the United States. After marrying years later, Tamara Terichow and her husband eventually settled in San Rafael, California. While Alexsander died in 1988, Lidia survived, never losing hope that she would one day be connected with her beloved sister. Tamara too had known nothing about the fate or whereabouts of her older sister — for more than seven decades. She had tried to cope with the loss in part by never speaking of her adoption with her American family. But that all changed last fall around Thanksgiving. Seventy-two years after being separated from her sister, Tamara received a phone call she will never forget. It was from the Red Cross Restoring Family Links (RFL) program, and the person on the phone informed Tamara that Lidia was alive and well — and looking for her. It was a phone call to be truly thankful for. At long last, their long-hoped-for reunion was in the works. Tamara, now 83, speaks tearfully about the sisters’ separation and their eventual reunion, which took place earlier this year in Finland. “It hurts me that for the longest time I tried to keep my mum in my memory and same thing with my sister,” she says, explaining that even the most hopeful memories fade over time. But hope, luck, and the services of the Red Cross enabled Tamara to finally reunite with her sister. “It is such good work,” she says about the RFL program operated by the global Red Cross and Red Crescent network. The United Nations reports that 68.5 million people were displaced worldwide in 2017 due to violence, war, and other forms of persecution. “No one becomes a refugee by choice; but the rest of us can have a choice about how we help,” stated U.N. High Commissioner for Refugees Filippo Grandi on the eve of World Refugee Day 2018. Given the scale of the challenge, humanitarian organizations like the Red Cross — through its Restoring Family Links program — are playing a vital role in reconnecting families, as well as supporting those who are displaced. Tamara has one other bit of important advice: “Keep on hoping,” she says, even if doing so becomes difficult to do. “If my sister didn’t talk about it, nothing would have happened,” Tamara says. About the author: Samar M. Salma is a volunteer writer for the American Red Cross. She currently resides in Monterey. About the Restoring Family Links program: Through RFL, the American Red Cross, the International Committee of the Red Cross, and Red Cross and Red Crescent societies around the globe work together to locate people and put them back into contact with their relatives. This work includes looking for family members separated by conflict, disaster, or migration. Thank you for your inspiring story about Tamara and Lidia. I salute to Volunteers of RED CROSS for their selfless service to humanity.